Associate Editor at The Tower. You wouldn’t expect conspiracy theories about Jews and their control of world events to be promoted in a church today. But that is exactly what was preached last month in Washington. 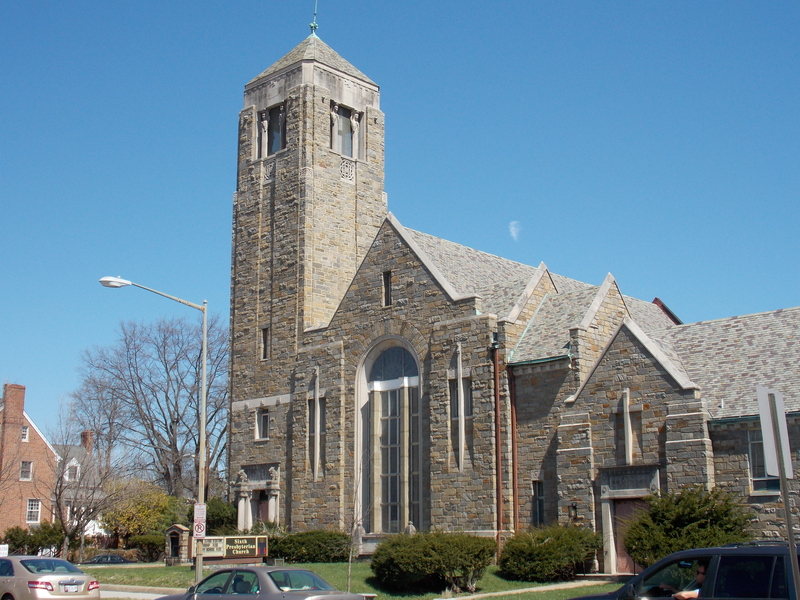 It was a clear May morning, and the sun streamed into DC’s Sixth Presbyterian Church through colorful mosaic windows, splashing off the stone columns and saturating the dark wooden altar. Handwritten signs directed a steady trickle of attendees into the room, where they exchanged greetings before scattering among the pews. In the end, there were over 60 people gathered. There was an air of anticipation as the choir reached its final crescendo and a young man rose to the pulpit. Introduced as the Rev. Dr. Heber M. Brown III, he was a senior preacher at a Baptist church in Baltimore. He had been involved in the protests that rocked the city after the arrest and death of Freddie Gray, and spoke of walking side by side with a diverse coalition of faith groups and street gangs. The Crips and Bloods, the Fruit of Islam, and Christians of all stripes had united on Baltimore’s streets in pursuit of social justice. Brown painted vivid pictures of a community rising up in rebellion to defend its dignity. Such rhetoric seemed more suited to a hate rally than a small African-American church in the nation’s capital. But it electrified Rev. 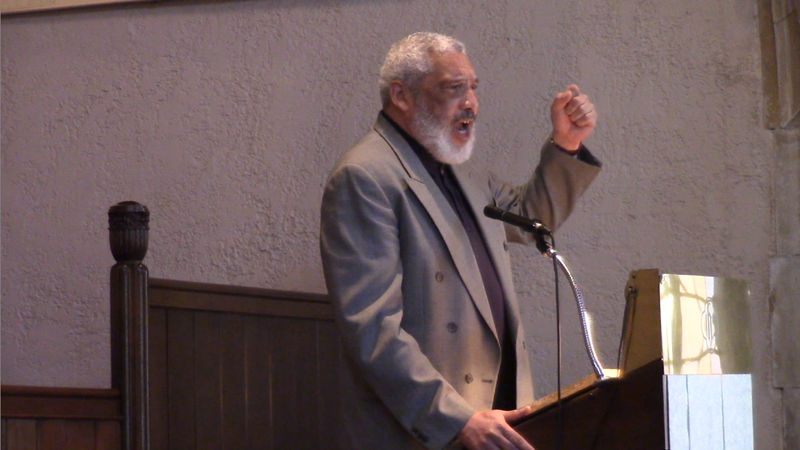 Brown’s audience, which had gathered there for a very specific purpose: They were attending a spring program by Sabeel DC Metro, which sought to persuade African-American Christians and churches to join a crusade against the State of Israel. Ateek’s theology, which supposedly challenges a literal understanding of the Old Testament as a “Zionist text,” features violent imagery that depicts Jewish acts of deicide as well as forceful repudiations of Jewish national self-determination. During Christmas celebrations in 2000, Ateek spoke of destructive “modern-day ‘Herods’…in the Israeli government,” and in his 2001 Easter address, declared that “Palestine has become one huge Golgotha. The Israeli government crucifixion system is operating daily.” He later likened the occupation of the West Bank to “the stone placed on the entrance of Jesus’ tomb.” In one particularly memorable address, he compared Israel’s creation to Original Sin, and contested that Judaism does not teach its adherents to love non-Jews. Sabeel uses the language of liberation theology. That theology speaks with words such as oppressed and oppressor; it speaks of suffering and crucifixion—biblical images that relate to the experience of brutality and the misuse of power. Those who do not want the State of Israel to be criticized deny these accusations and label liberation theology as anti-Semitic. They deny the violence of the occupation and all of its ugly ramifications—settlements, land confiscations, demolition of homes, state violence against civilians. Toll’s tolerance of Ateek’s blatant anti-Semitism and deliberate misrepresentation of his critics’ concerns underscores FOSNA’s willingness to endorse hateful rhetoric while professing to support nonviolent reconciliation. Indeed, FOSNA energetically promotes Ateek’s variation on liberation theology through affiliates across North America, Europe, and Australia, establishing an ecumenical network of churches that works to advance Ateek’s ideology in the West. Sabeel claims to seek a “just and durable peace” for Israelis and Palestinians, and has previously called for “two sovereign and fully democratic states.” This position is belied, however, by both Ateek’s bitter repudiation of Zionism and Sabeel’s self-proclaimed “vision for the future”: The establishment of “a bi-national state in Palestine-Israel.” The two-state solution is but a stepping stone toward this goal. This is likely also a major reason why Sabeel insists on the Palestinian “right of return,” i.e., the immigration of over five million Palestinian refugees to Israel. With an Israeli population of a little over six million Jews and 1.7 million Arabs, this would render Israeli Jews a minority in their own nation-state and result in the establishment of an Arab state in its stead. Accordingly, when various Palestinian groups united under the banner of BDS in 2005, Sabeel released a “Call for Morally Responsible Investment,” which advocated pressuring companies to cease activities that “provide products, services, or technology that sustain, support, or maintain the occupation.” While Sabeel specified that this call is “focused on companies directly involved in illegal practices in the Occupied Territories and not in Israel itself,” both Ateek and FOSNA have repeatedly advocated for a much broader boycott. 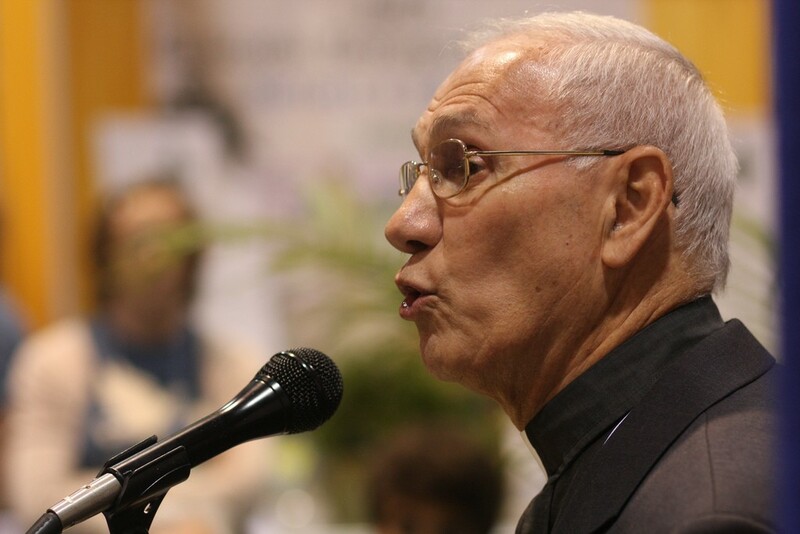 In 2009, Ateek and a group of Palestinian Christian leaders authored the Kairos Palestine document, named after the 1985 appeal issued by black South African pastors to challenge the Christian community’s response to the apartheid regime. Kairos Palestine endorses a “system of economic sanctions and boycott” against Israel and explicitly supports the BDS movement. Similarly, FOSNA has affirmed its approval of BDS, and in a 2010 Christmas flyer targeted ten Israeli and multinational brands that allegedly “produce goods in such a way that directly harms Palestinians—exploiting labor, developing technology for military operations, or supplying equipment for illegal settlements.” Offenders included Dorot Garlic and Herbs, with the curious explanation that the company’s products, which are sold across the United States, “are shipped halfway around the world when they could easily be purchased locally.” Also included was Intel, which operates two plants in the southern Israeli city of Kiryat Gat on land that the organization Al-Awda—the Palestinian Right to Return Coalition—claims as the former location of the Palestinian village Iraq al-Manshiya. There were no objections to these attacks. The conference promised “a panel featuring Palestinian and Jewish viewpoints and experiences”; but was, in reality, entirely one-sided. Brown and Hagler were joined by a panel featuring Tarek Abuata, a board member of FOSNA, and Dr. Mai Abdul Rahman, a commissioner at the DC Office of Human Rights. The “Jewish viewpoints” were conveyed by Shelley Cohen Fudge of the fringe group Jewish Voice for Peace, whose ideology is little different from Sabeel’s. Indeed, all of the speakers uniformly advanced Sabeel’s Manichean narrative of good, oppressed Palestinians versus evil and oppressive Israel. As Rahman put it, Palestine may be occupied, but it is also “giggles and happiness and fun.” Israelis, by contrast, were depicted as genocidal racists, foreigners, and oppressors who are engaged in a colonialist project and control the American government. And when Hagler boomed, “We got to stand up against the occupation! We got to stand for boycott, divestment, and sanctions!” the audience cheered in jubilation. It seemed that the demonization and, indeed, eventual destruction of the Jewish state had been adopted as a righteous cause by a crowd of well-meaning people. It would be easy to dismiss all this as the work of fringe activists, hateful outliers whose views are rejected by the majority of Americans, including African-American Protestants. After all, the largest pro-Israel organization in the United States is called Christians United for Israel, and American support for Israel in general transcends denomination. But while Sabeel’s activists and supporters don’t profess popular views, they seem to regard this as a minor inconvenience that should not prevent them from speaking on behalf of entire communities. Regardless of the tactics Sabeel’s activists choose to employ, they will continue working to push their ideology into the mainstream Christian conversation, shrouding it beneath a veil of piousness and the rhetoric of peace until—they hope—it becomes conventional wisdom. But despite its claims, Sabeel is not in the business of promoting understanding and reconciliation. An organization so steeped in aggressive vilification, one that treats the Jewish right to national self-determination as a temporary stumbling block in the way of an “ultimate vision” of a single, bi-national Palestine, is not a conscientious actor in pursuit of peace. Sabeel is on a mission to delegitimize and destroy the State of Israel, attracting well-meaning congregations with platitudes and calls to actions that, ultimately, only serve to advance a radical nationalist agenda. Uncontested, it will continue to attack the Jewish state and its allies in the pews, preaching a message that may resonate far beyond the altar of Sixth Presbyterian Church.